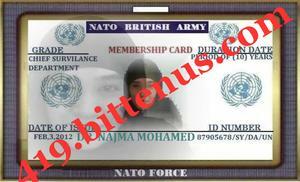 In response to your mail, here in the military base of SYRIA we are not allowed to disclose our identities or make unofficial calls we have access to computer once in a day, please assure me that you will not do anything with my id proof, here in the attachment is my working id proof, please don't hurt me with my id as i have big trust on you that you are a nice person, please don' t betray me when ever i decided to send down my future money for you to invest for me after buying your property, if you provide me with your full name, home or office address, age, contact number, occupation and a valid id proof i will proceed to the ABC registration office to make the registration of the consignment box because i am writing you this mail now the total sum of $5.7 million us dollars is with me but i am afraid that the rebels may discover it one day and take it away from me, please be fast to send me the required details if you really want to help me out of SYRIA. Regarding your details in our office and parcel we were able to complete every formality regarding your Consignment Box. We received and have noted your delivery address sent to us. 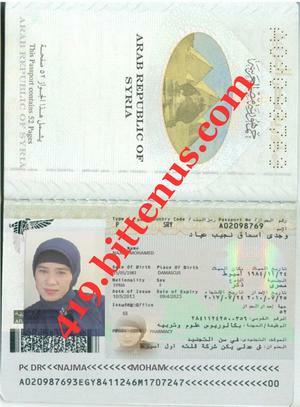 This is to bring to your notice that you will be receiving your parcel which contains some medical Documents registered by your sender in our office here is Syria kindly get back to her to provide you the required document for identification of your Consignment Box Immediately. THANK YOU FOR USING ABC SHIPPING AND CARGO WORLD WIDE FOR YOUR DELIVERY AND BUSINESS NEEDS. FOR MORE INQUIRIES TEL/WhasApp: +31687998127 / +447459767304. PRESENT YOUR ORDER NUMBER WHEN CALLING SO WE CAN HONOR YOUR CALLS. WE ARE GLAD TO BE AT YOUR SERVICE.